Worktable? Sawhorse? Both! Strong yet compact, the Pegasus table instantly converts from a clamping work table supporting 300 lbs. to a 1,000-lb. capacity sawhorse. The lightweight design means it’s easy to bring your Pegasus portable workbench wherever it’s needed. The foldable work table’s quick clamps and clamp dogs let you securely hold a variety of materials. Connect multiple Pegasus work tables together to create a unique and versatile work area. As either a collapsible work table that supports loads up to 300 lbs. or a durable sawhorse supporting up to 1,000 lbs., the Pegasus folding portable workbench is sure to become one of the staples of your workshop. The compact and folding work bench table design allows for easy transport, and the Pegasus multi function work table folds down for space-saving storage. Easily bring your folding work table with you wherever it is needed. The Pegasus portable workbench includes four clamp dogs and two quick clamps to hold a variety of materials and stabilize unique shapes, so you can feel confident securing a variety of materials for the job at hand. WHY CHOOSE THE PEGASUS WORK TABLE? The Pegasus folding workbench can be used as either a worktable or a sawhorse, depending on the needs of your project. The portable folding work table has an integrated clamping system that holds a variety of materials firmly in place, freeing your hands to tackle your project. The Pegasus collapsible work table is lightweight and foldable, allowing for easy transport and convenient storage. A convenient storage shelf within the clamping work table lets you keep your tools and supplies on hand, as well as place to attach your power strip for easy access. The folding portable workbench has an innovative design that lets you connect multiple Pegasus table units together. The Pegasus fold up work table also has the exact same working height as its WORX brethren the Sidekick and the Clamping Sawhorse. The Pegasus will quickly become the go-to support mainstay in your workshop. This versatile tool supports 300 lbs. as a worktable and 1,000 lbs. as a sawhorse. Lightweight and foldable, the Pegasus can be easily transported so that you can take it wherever the work is. Great as an outdoor yard and garden workplace too. The Pegasus has an integrated clamping system that conveniently holds any materials your project demands. The included 2 bar clamps and 4 clamp dogs keep your materials in place and frees up your hands to keep working. The Pegasus has a convenient storage shelf that holds your tools and supplies. You can also attach your power strip for easy access as well. How heavy is the Pegasus Folding Work Table & Sawhorse? The Worx Pegasus weighs 30 lbs. The sturdy construction and lightweight design make it a great portable work table for a wide range of projects and applications. What is the Pegasus made out of? The Pegasus folding work table & sawhorse is made out of a durable, molded ABS with steel supports and fittings. What are the dimensions of the Pegasus? Open: Table Size - 31" x 25" Working Height - 32"
How much weight can the Pegasus handle? The Pegasus is strong and as durable as a work table or sawhorse. As a worktable, the Pegasus has a capacity of 300 lbs. When used as a sawhorse, the load capacity for Pegasus is 1,000 lbs. What is the clamp load? What is the clamping pressure/force? The clamps can handle materials up to 18” in either a horizontal or a vertical position. The clamps can provide a maximum force of up to 300 lbs. What will I receive with the Pegasus? Each Worx Pegasus Folding Work Table & Sawhorse comes with 2 clamps and 4 clamp dogs. Clamp dogs are pieces that will snap into the worktable to help stabilize and secure unique shapes and provide additional support for clamping projects. Each Pegasus will also come with two link locks to connect multiple tables. 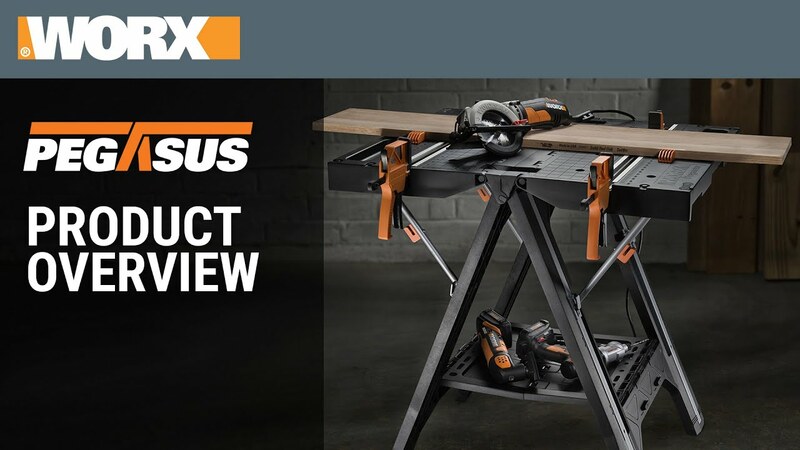 Is the Pegasus compatible with the Worx Clamping Sawhorses? What about sawhorses from other brands? 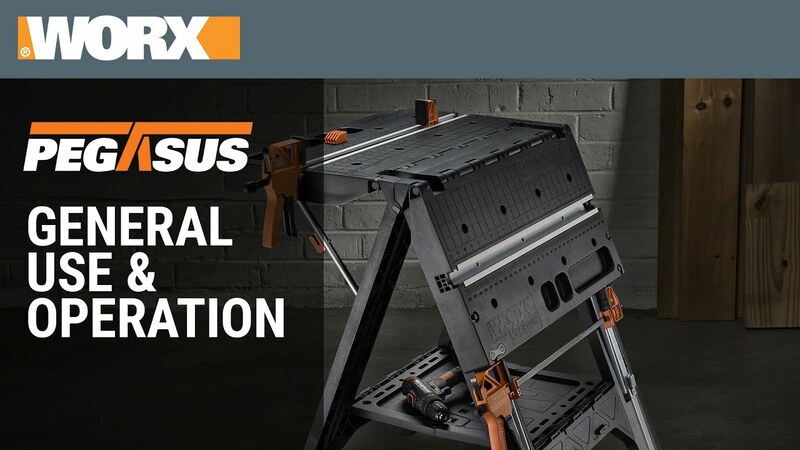 Yes, the Worx Pegasus coordinates with the Worx Clamping Sawhorses and Worx Sidekick. They are the same working height, feature the same joiners and attachment points to make larger projects easier to tackle, or to create a custom workspace that can be disassembled and stored in limited space. While the working height of these tables will be consistent between Worx products, keep in mind that attaching different models with varying table dimensions together may mean the table edges won't line up exactly. The joiners are designed to prevent slippage during use. If you're looking for a perfect match or additional security, we recommend pairing up two of the same model tables. The compatibility of the Pegasus with other brands will vary. The industry standard height for most sawhorses is a working height of about 28-32 inches. The working height of the WORX Pegasus is 32 inches. I saw that the WORX Clamping Sawhorse also has clamps. Are the clamps on the Pegasus the same? Yes! The clamps that are included with the WORX Clamping Sawhorses are the same as the clamps included with the Pegasus. Yes, the Pegasus Folding Worktable & Sawhorse is designed to be compact and easy to store, which makes them ideal for shipping, too. Each Pegasus is fully assembled so once you open the packaging, you’re ready to get to work! The corner of my Pegasus worktable bends down. Is this normal? No, it isn’t. Be sure to check and make sure that the table supports are locked in place. They should click and keep the table level once secured. The tabletop sides of my Pegasus fold slowly once unlocked. Is this normal? Yes. The Pegasus tabletop is designed to fold down slowly after the clips are released as a safety feature to prevent slamming or pinching fingers. Are there any precautions I should follow when using the Pegasus Folding Worktable & Sawhorse? While there aren’t any specific hazards related to the Pegasus, we recommend that all our customers follow standard safety precautions while using our tools – including wearing safety eyewear, gloves, appropriate shoes & clothing, and keeping hair tied back. ATTENTION: While folding and/or transporting the Pegasus, keep fingers clear of the folding joint to avoid getting pinched. The Pegasus does fold flat, and fingers may get caught between the two sides of the tool when folding. Also, note that the tool does not lock when shut. Hold securely shut to avoid additional pinch hazard. You can download the You can download the manual here. 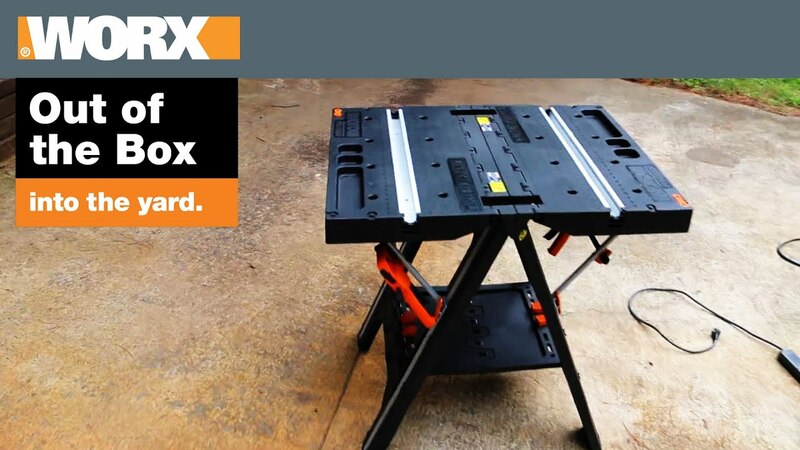 If you decide the WORX Pegasus Folding Worktable & Sawhorse isn’t right for you, we offer a 30-day Money Back Guarantee from date of receipt (less shipping and handling). Please call our customer service center at 1-866-354-9679 (WORX) and we’ll be happy to assist. View more information here. We know your tools are indispensable, so we cover the Pegasus with a 6 Year Limited Consumer Warranty. Register your Pegasus online to lock in your 6 Year Warranty. Already have your Pegasus? Register now! Need extra clamp dogs? Lose the joiners to link up two tables? Many replacement parts are available online under Accessories. Pegasus Folding Work Table & Sawhorse is rated 4.8 out of 5 by 705. Rated 5 out of 5 by Nmdragon from Happy with purchase Nice. Sturdy work surface. Rated 5 out of 5 by Tanker60 from Great work table When my table arrived, I put it to work right away. Have not found any faults. Truly a great tool. Rated 5 out of 5 by Stacy 182 from Owned for one year now! I like it everything they said a little short but I didn't read the spec's works great as said surprisingly I'm used of people lying nice tool. Rated 5 out of 5 by Aaron27 from Nice and sturdy. Folds up nicely for storage. Used this to help with the installation of a screen door. Very good balance and ease of use. Rated 5 out of 5 by guarini7 from Truly awesome additon I bought this less than a month ago and can't not belive I did not order it years ago. It really makes the job so much eaiser. it actually feels like I have an extra set of hands. My birthday is about a month away and asked my wife for another one so I could have two. This is the only portable work bench you should buy. Rated 5 out of 5 by Hooligan Mom from Fantastic Table for solo work As a 72 year old female woodworking newbie, this table has been a wonder! I've been able to clamp pieces for cutting, joining and just plain support with confidence. I would recommend the Pegasus to anyone who needs a stable work surface with multiple options on how to use. Whoever invented this deserves a raise! Rated 5 out of 5 by BoboMelon from Super easy to use. Super easy to use. Convenient work table with everything that you need to make your job/project easier. The clamps come in clutch and so do the rulers on the table itself. I love how there is a shelf underneath the table for your tools while working and also little divots in the table so you don’t lose any screws nails or other small Pieces. Rated 5 out of 5 by Frank4 from This product is a Great asset To not only my wood working but just in general as an all around help as a table and or a saw horse . The clamps are stronger than expected and the table sits at the perfect height for me. Rated 5 out of 5 by Toolman74 from Best purchase from the worx store so far. Great addition to both my worx saws. I have the blade runner and the 41/2 circular saw. From cutting to holding in place down to clamp and glue. Love this table. Maybe buying a second one since they can link together. Rated 5 out of 5 by Lighting Rod from Very handy I bought this product and immediately used it for a project. It was a perfect size for my project to use my new Worx circular saw, clamp and put my project together. Rated 5 out of 5 by Jh64 from Good buy I bought this for my project and it worked out great. Rated 5 out of 5 by Bud46 from Nice I received it a week or so ago. I used it as soon I saw it on my porch around 1am. Works great no more bending over n using my knee or a bucket to balance stuff when I have cut up kindling. Rated 5 out of 5 by mamissey from Work Table This tool is a life changer. I bought one for me and one for my son-in-law. Both of us love it. When we are working on it, it holds the wood in place for us to do what we need to do. No slipping or moving around. Glad I have it. Rated 5 out of 5 by KCross from Quality multipurpose table! With built in clamps, the abilty to attach another table to expand or convert easily to sawhorse, attach a power strip, this table does it all. Best work table I own and hope to get another. Worx products work for me. Rated 5 out of 5 by Cliff Beck from Best work table on the market My first Pegasus folding work table was a Christmas gift two years ago from my daughter and her husband. I raved about how much I enjoyed it - so my daughter and her husband bought me another for Christmas 2018. Now it is even better. I really enjoy the stability and the clamps that store under the table when folded - always right there on hand. Rated 5 out of 5 by Jlvf250 from Love this work table This table is so sturdy. Love the way they designed it. It's just what I needed for wood working and carving. You will not be disappointed. This is a great buy. Rated 5 out of 5 by Gabe Marin from A must have table A must have table for a carpenter,wood worker ,even for a rookie to start right. Strong table , expandable to your needs. Rated 5 out of 5 by Equinox13 from Fast & Handy Got this for Christmas. I have used it every weekend since. The ease with which you can set it up and take it down makes it so handy. I do wish they had a t-bar clamp that clamped downwards like some others. Maybe they will consider selling this as an add on. Rated 5 out of 5 by TVHo from BEST work table ever! I opened it up and before the day was over I had found 4 uses for it! It is a great addition to my small shop! Rated 5 out of 5 by Vicki 22 from Very well made! I have been using this alot recently and it stands up to work great! Feels very sturdy and stable!! Rated 5 out of 5 by wcrichburg from Absolutely Cool I received my Pegasus work table about a week ago was amazed at the sturdiness and fit and finish of the table. I haven't put it to work yet but I have enough upcoming projects to put it to work. Can't wait to see how it performs. Rated 5 out of 5 by Bob W12 from Lightweight, easy set up and built in clamps make This is a great work table. I wish I would have bought this sooner. Rated 5 out of 5 by Nole1979 from Pegasus - Rising What an outstanding support tool! Many times I am having to do things around the house or outside and this helps with of my tasks. I wish something like this was available years ago. I absolutely love it. Rated 5 out of 5 by MartyC from So versatile I can’t say enough positive things about this work table. It’s well Des Itani well built. Very easy to open and close as well as move around. Rated 5 out of 5 by Klwctr from Very sturdy and functional I love this table. It is perfect for all my projects. Rated 5 out of 5 by GLAGrizz from Pegasus Folding Work Table & Sawhors Bought this as a gift for each of my sons this Christmas. My oldest son called me complaining about problems he was having installing a new doggie door, which required cutting a larger hole in the door. I asked if he was using his new Pegasus and he said "I haven't put it together yet". I explained it was already to go, so he used it and it made his job way easier! He was quite impressed when his job was done. I will be buying one for myself soon.